Are you ready to have your most inspirational year ever? It is time to Awaken your Extraordinary Life with this powerful self-study program! Make real changes in your life that lead you to more satisfaction and joy? Make sure your life isn’t the same in five years? Set goals that you attain with energy and excitment? Then this journal is for you!! has opened my eyes to just how much power I have to attract everything I want. Setting goals that come from a deeper, more meaningful place. Revisiting your goals on a monthly basis to set new action steps for the month. No more letting your goals slip away by the end of the week! Monthly topics that help deepen your learning and self-awareness. From Laura: I have been Life Coach and Yoga Educator for over two decades. This journal is a product of years of work inspiring my clients to make changes in their lives. These are the steps that work, that affect change that sticks! Is Your Life Spinning Out of Control? Have you noticed that you are living in “avoidance” instead of “abundance?” Then, here’s your invitation to take control of your life and start moving toward a purposeful goal. This journal is your link to exploring your desires and clarifying dreams. Each month, you will complete an exercise that will inspire you and take you closer to Extraordinary Life. You will also consciously revisit your goals for the year and set smaller steps for the month. 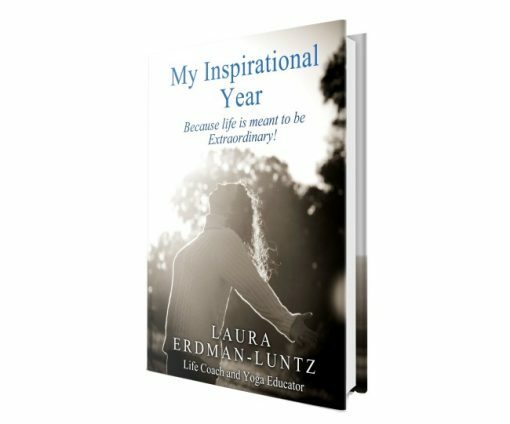 “I began Laura Erdman-Luntz’s ‘Ignite Your Life’ program in May 2010. Half-way through the workbook/calendar year, I remember sitting in a coffee shop doing my monthly intentions, and looking back at the first few pages of my yearly motivations. In each category (financial, relationship, career), I was shocked to see how many of the seemingly ‘lofty goals’ I had set for myself in the beginning were already achieved! And the truly amazing part was the other parts of my life that had manifested from my subconscious motivations. I realized then that I had de-cluttered my life of so many of the negative things and people that brought my frequency level down, and was proud of myself for surrounding myself with those who support the person I was becoming. In one year, I changed my lifestyle and roles in such a positive way, I know I’ve inspired others. I became a wife, a mother, a business owner, a true yogi, and a leader in my community! How long have yearned to get control of your life? If you don’t take action now, will things be any different one year from today? Your Extraordinary Life is within. . .why not awaken it now. Exciting, isn’t it? Let’s get you started! To order your journal without an autograpch, click “Purchase the journal” below. You will be taken to LuLu.com, our publisher. Simply order it through their secure marketplace. You will receive your journal in a few days.